A truly first in Malaysia, Hatten Group presents its fully-interactive live environmental theatre production of Nyonya Memoirs. 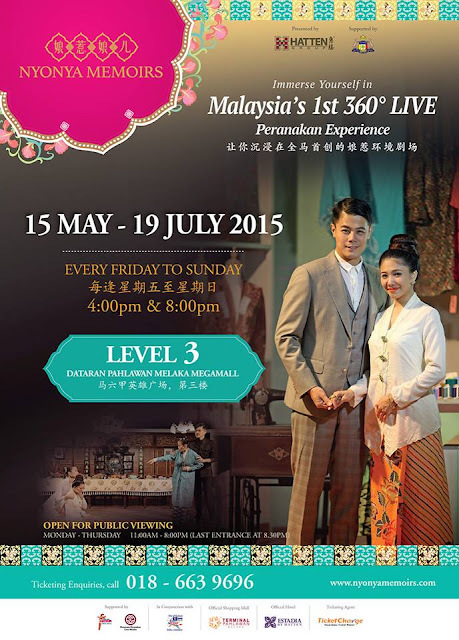 Featuring a revolutionary new concept of 360 degree Live Peranakan Experience, Nyonya Memoirs is set in the historical city of Malacca at Dataran Pahlawan. 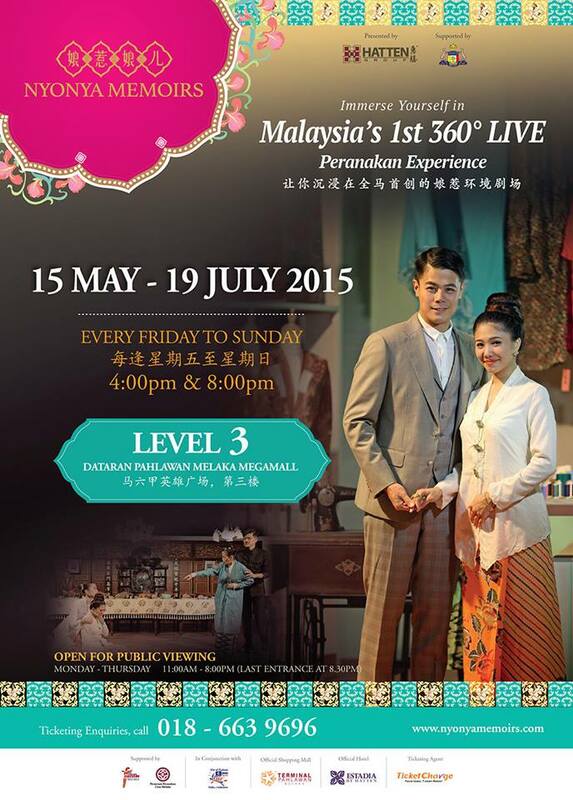 Premiered in May 2015, the theatre production of Nyonya Memoirs runs till 19 July 2015. Hatten Group spared no expense at this RM8million investment, taking on the very best of the production team, the star-studded cast, the theatre set and the costumes. The inspiration for this project is in line with the State Government’s goals to highlight local culture with the main objective of promoting a deeper appreciation for our city’s Peranakan heritage. It is truly a wondrous theatrical show with musical and dance performances injected into Nyonya Memoirs. The concept centers on the traditions and customs of the Peranakan culture where everything goes by the Baba Nyonya beliefs. 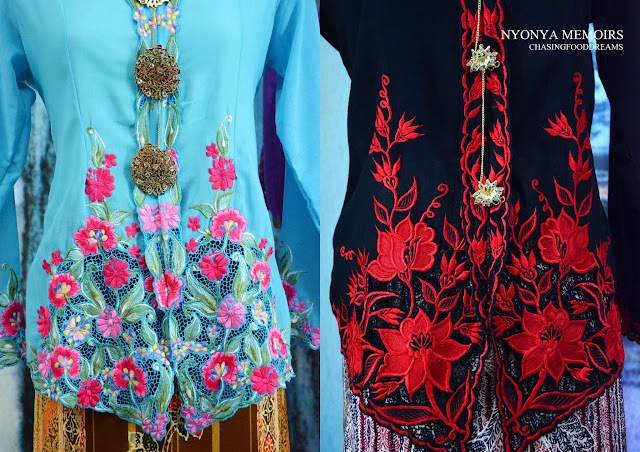 Located on Level 3 of Dataran Pahlawan, the Nyonya Memoirs production is amazingly gorgeous. The show is available every Friday, Saturday and Sunday with two show times of 4pm and 8pm respectively. Boasting of a A-list production team of Atlantic Theatre and Production with renowned director, James Lee, winner of the Best ASEAN Film Award with the musical score directed by Tan Yue Hue, who has worked with international artistes while the cast is coached by Pearly Chua, nominee for Best Supporting Actress at the 43rd Golden Horse Film Festival and the costumes are designed by Beatrice Looi, Malaysia’s top international fashion designer. My family and I caught a Saturday show in the afternoon at 4pm one weekend. I was really excited when I walked into the theatre. To my surprise, I even met a very good friend, Merryn and her family there too that same day. We were ushered into a long hall decorated with Peranakan heritage. Showcase displaying Nyonya kebayas with gorgeous embroidery works, hand beaded shoes and intricate jewelry pieces together with a typical Nyonya kitchen and its utensils, intricate wood carvings and finally a typical Nyonya cuisine of Nyonya Kuih had everyone busy clicking their phones and cameras while waiting for the show to start. We were suddenly greeted by the housekeeper, Tao Jie who boisterously warmed us up with a few information about the cultures of the Peranakan and proceeded to guide us into the set. Nyonya Memoirs is about a lover’s tale between a wealthy Nyonya girl by the name of Bao Zhu, played by Dorothy Foo and her love for a poor common Baba, Zhang Min, played by Evan Siau. The couple faces the obstacles of the family’s disagreement of their union due to the social differences of their respective lives. Immerse yourselves as the story unfolds through its own magical and musical production through the unusual concept of having viewers watch the show through a moving production set. Nyonya Memoirs is performed in Mandarin mostly together with a mixture of Peranakan dialect thrown in such as Bahasa Melayu and some local languages. For those who are not well-versed with Mandarin, fear not as there are screen displays all over translating the conversation to English. As soon as we step into the set, all 600 meters of it cleverly designed to echo the era of a typical Peranakan location, we were drawn to the main area of a garden right in the center of the room. Flanked with a green lawn and trees surrounding the garden, it is the main area of where the show starts off. Surrounding the garden are shops of yesteryears, typical Nyonya household and streets of those good old Peranakan days. The theatre set is a sight to behold as there were just so many things that really reminded me of my own heritage as my father is a northern Baba himself, whom also just so happen to marry my mother who is actually a non-Nyonya. An energetic and smiley storykeeper played by Li Qiang proceeded to gather everyone’s’ attention and rolled out the storytelling of the lovers. The story kicks off with Zhang Min getting all excited to propose his love and hand in marriage to his beloved Bao Zhu where he even gets the viewer involve by asking them their opinions. As mentioned, this is an interactive production so one may never know if you may just be included in the show! Here are scenes of the lovers enjoying a serene and happy moment of themselves. In every family, there will always be a few black sheep of the family whose intent are purely mischievous and malicious. In Nyonya Memoirs, there, they are the uncle and aunt of Bao Zhu, who simply cannot resist to inject their slandering of the couple at every chance they get. I do have to admire both of Bao Zhu's uncle and aunt, seen here with Bao Zhu's father as they really played their part so well and both are really full of expressions and emotions. Zhang Min meeting the family for the first time. A scene from a typical Nyonya Tok Panjang in the dining room where Baba Nyonya dines on a feast of sumptuous Peranakan cuisine. This is also where family times were once a must in every household as everyone would gather together for family time. Here it is to celebrate Bao Zhu's mother's birthday. Here are more scenes of Nyonya Memoirs but there will be no spoilers as one should really go and enjoy the experience yourselves! 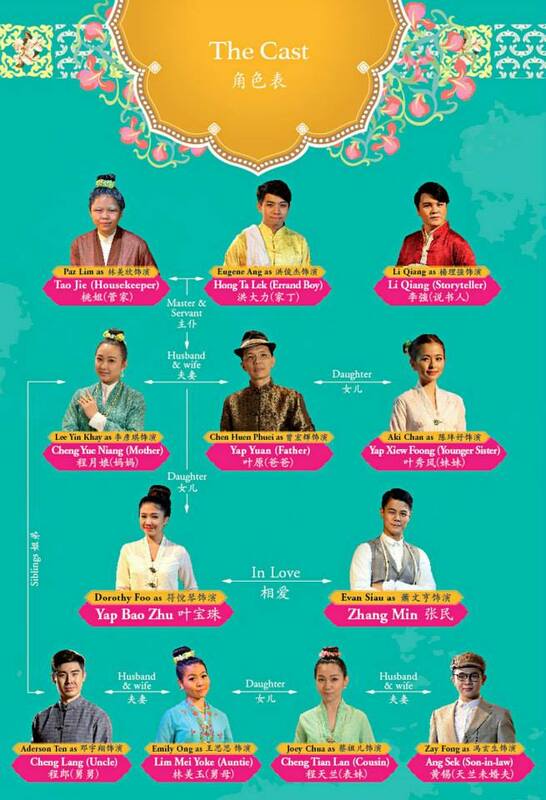 Moments of despair from the couples as their family feuds continues with Bao Zhu’s mother, Yue Niang who objects while her father is left with heartache as he see his daughter suffers through the Peranakan beliefs. Viewers will be glad to know though that the couple did get their happy ending but you have to watch how they got it yourselves… there are quite a few touching scenes which I omitted here as I was too touch and busy enjoying those moments. Go with an open mind and soak in the story whole heartedly for an unforgettable experience! The show ended with the parade of Zhang Min and Bao Zhu’s grand wedding together with all the cast dressed in traditional wedding costumes at the Lover’s Bridge in the mall. The 360 degree theatre experience is a lovely and fascinating experience while the cast and costumes are equally amazing. Together with the musical and dance performances plus the interactive parts, Nyonya Memoirs is a theatrical production unlike any others we have here in Malaysia. Don’t miss this truly heart-warming and delightful Nyonya Memoirs by Hatten Group! For more information or to book your tickets, please log on to www.nyonyamemoirs.com or visit the Nyonya Memoirs ticketing counter at Level 3, Dataran Pahlawan Melaka Megamall or call hotline at + 6018 663 9696. Tickets can also be purchase online or at the concierge of Hatten Hotel & Estadia by Hatten Hotel. Indeed a very unique experience! PS: Your photos almost reveal all the scene of this performance lah, haha! I hope they serve kuih during intermissions!